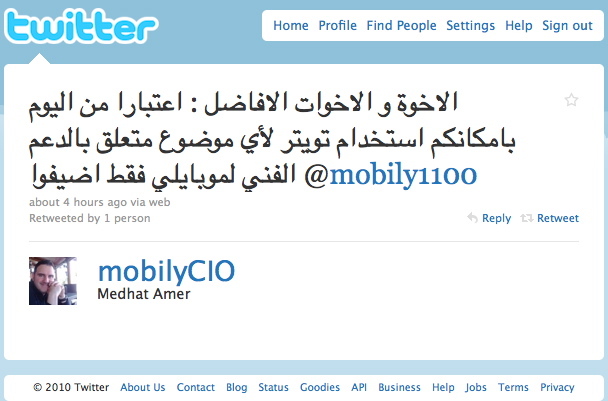 At the beginning of the year, Twitter added Arabic, Farsi, Hebrew and Urdu to the Twitter Translation Center. This was supposed to be the first step to making these four different languages available on the micro-blogging site. Well, on Tuesday, March 6 Twitter announced that things are finally ready to go. This will be the very first time that Twitter has offered the option of right-to-left languages. "We first added these four languages to the Twitter Translation Center on January 25," a Twitter blog post read. "Thirteen thousand volunteers around the blog immediately got to work, translating and localizing Twitter.com into these languages in record time." Twitter’s Translation Center works to make even more languages available on the site. It is made up of more than 425,000 volunteers from around the world. Currently, it is looking for translators to work on close to 30 different languages. Twitter said that there were many different people who worked to translate the latest four languages that the company now offers. As of today, Twitter offers 28 different languages. It is very impressive how quickly they were able to add the four newest languages. They were able to translate everything necessary in about a month and a half. In April 2008 Twitter started adding foreign languages to its site. The first language to launch was Japanese. In November 2009 the social media site added Spanish and French. Russian and Turkish were added in April 2011, Dutch and Indonesian in August and in September, Chinese, Hindi, Filipino and Malay. According to Twitter, it plans to keep adding as many languages as it can in 2012. Eric Ward Selling Ads for Text Link Ads?